At last! A very good review, for a very good set! I want to ask you about one thing: I want to make a MOC in silver, black, and the least red as possible. The only HF sets that I have are Drilldozer and Raw-Jaw. I need more silver and black pieces. And I don't know if should I get Jawblade (this is the sure one) and Thornraxx or Reapa... I like Reapa a lot, but Thornraxx is also very cool!!! Which of those 2 sets should I get? Well I have Reapa, and he is great! As far as black and silver, he has the new shoulder pads in black, three black armor shells, and one of the 'right-angle' (as JANG called them) pieces that Thornraxx has two of. By the right angle piece you mean the piece to stick on Waspix's lower arms on. Thorraxx for Black Armour. And Toxic Reapa for Translucent green Armour (3 long). The orange fangs have been in a few Ninjago dragon sets. The dark azure color was featured in the Alien Conquest sets. Yeah.I have the ninjago ice dragon set and that has got those orange pieces as claws. First Comment! (I think).I like the Furno 3.0 wings in black! 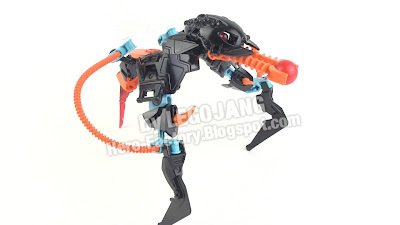 And also, is that the sawe dark azure from the Bionicle 2003 Matoro set? Do the wings have a hologram effect?